You can get it at any Afghan embassy or consulate throughout the world. But at some of them it is easier than at others. Most applications come from NGO workers and journalists, so at certain locations your request for a tourist visa can look strange. You should not be denied it, though. In Islamabad the embassy workers are ready to issue a visa in two–three days, but they want to see a letter of introduction from your native embassy. Depending on your country, it is either free, or expensive, or impossible to get. Remember that you will need one for the Iranian visa, too, and if you want to get both visas in Islamabad, it is better to get two letters at the same time. The letter should specifically say which country you are being introduced to and for what kind of a visa. Peshawar is the easiest place to get the Afghan visa. You show up on Tuesday or Thursday morning, file an application with one photo and photocopies of certain pages of your passport, pay 30 dollars, and get the visa in afternoon. It is valid for 30 days to cross the border and for 30 days to stay in the country. Whether these are the same 30 days — meaning, whether your 30 days of stay start ticking on the day of issue — is a big question, and you better get the answer in advance, because I did not know it and thought it better to leave the country before both 30 days have expired. In any case, the border officials can have a different idea from what you have been told at the consulate. Therefore, ideally you should get the visa stamped in your passport the day before you leave Pakistan for Afghanistan. The details of getting the visa in Peshawar are in the Peshawar section. Also notice that apparently the Japanese embassy in Pakistan has complained to the Afghans that they issued visas to the Japanese too easily. After that even the Peshawar consulate began demanding letters of introduction from the Japanese, which they were then flatly refused by the Japanese embassy. The end result was that the Japanese now had to slip 100 dollars with their application, and that gets them a visa in Peshawar without any letters. This is hearsay, and somewhat outdated hearsay at that — if you are Japanese, get the current information in advance. You can extend your visa in Kabul. Specific Afghan diplomatic missions are listed below. You should know two things about all e-mail addresses on this page. First, there are some others listed in the internet, especially on the Ariana's web-site. They do not work, I have tried them. Second, I wrote to all addresses listed here and have not got even one reply. There are many more Afghan missions, of course. Because Pakistan and India often are on the brink of war, equally often you can not get a Pakistani visa in India. In Kathmandu, Nepal, the embassy issues visas on the next day after you submit an application and a consular worker interviews you on your motives. A single entry visa costs about 60 dollars — or more, depending on your nationality. A double entry one is double that. 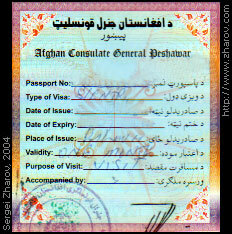 A visa is activated on the day of issue. The length of stay depends on what you tell the consular officer. You can extend your visa in Pakistan. That should be free if you have not overstayed it yet. If you overstay it by no more than 14 days, you have to get a certificate of no objection from the Foreign Office in Islamabad and pay about the same amount as the original visa cost you. The length of extension depends on the story you tell. A month is no problem. If you overstay by more than 14 days, you will still need the certificate, but instead of an extension you will be ordered to leave after paying a large fine. You will not be let out of the country otherwise. If you plan to come back to Pakistan from Afghanistan, you need a double entry visa. The alternative is to get a re-entry permit. You can do that in Peshawar or Islamabad. It is just like a new visa, only you get it while still in the country. It costs slightly more than a single entry visa. So, it is better to get the number of entries and the length of stay needed for your particular plans rather than lose time and money with extensions and re-entry permits later. While you can apply for a Pakistani visa in Afghanistan, you should not count on getting it. Bear in mind that it is also difficult to get a visa for any neighboring country in Afghanistan — be it Iran or Central Asian republics. If something goes wrong with the Pakistani visa, you will most likely have to take a plane from Kabul to a country you can enter without a visa. The list of plane destinations is not large, and, practically speaking, Germany is the only country on the list for which many people do not need a visa. If you are not one of those people, you cannot leave Afghanistan by air either. And you have a problem now. Therefore, it is better to enter Afghanistan with an already prepared way out. 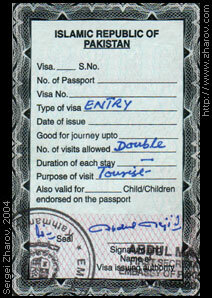 You may get or not get additional stamps on your visa: “Not valid for the Cantt area” and “Exempt from registration”. The first one means that you can not enter military areas, cantonments. Since they often are located in cities and are not fenced off, it is quite easy to accidentally wander inside. The second stamp means you do not have to register with the police when you come to each new city. If you do not have it, you have to register. This is a major pain. To issue a tourist visa, an embassy has to get a clearance for you from Tehran. That takes weeks. It is easier to get a transit visa, for which you will need a visa for the country you will supposedly enter after Iran. Remember that transit visas can not be extended at all. Even if you have been told otherwise at the embassy. If you apply for a visa outside of your country of residence, you need a letter of introduction from your embassy. Everywhere. At the Iranian embassy in Kabul there are giant lines of the local Shiites. If the guards do not put you at the head of the line, you are in for a few days of sunbathing at the embassy's gates. There is a consulate in Herat. The day you enter Iran counts as a full day of stay. In other words, if you have a seven-day visa and enter the country on, say, the first of November, you have to leave it before 24:00 of the seventh of November.